Washington (CNN) - Donald Trump is now tied with Mike Huckabee for first place when Republicans are asked who they support for the GOP presidential nomination in 2012, according to a new national poll. But while a CNN/Opinion Research Corporation survey released Tuesday indicates that the real estate mogul and reality TV star has nearly doubled his support since mid-March, it doesn't mean he has smooth sailing ahead. "More than four in ten Republicans say they would not like to see Trump toss his hat in the ring," says CNN Polling Director Keating Holland. Nineteen percent of Republicans and Republican-leaning independents questioned in the poll say that as of now, they'd be most likely to support Trump for next year's GOP presidential nomination. 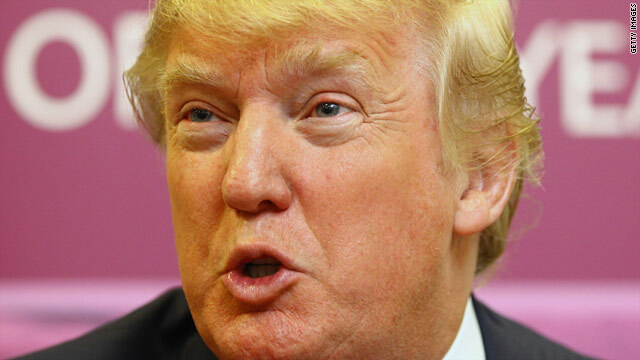 Trump says he'll decide by June whether he runs for the White House. An equal amount say they'd back Huckabee. The former Arkansas governor and 2008 Republican presidential candidate says he'll decide by later this year if he'll make another bid for the White House. Twelve percent say they'd support former Gov. Sarah Palin of Alaska, who was the party's 2008 vice presidential nominee, with 11 percent backing former Massachusetts Gov. and 2008 White House hopeful Mitt Romney and the same amount supporting former House Speaker Newt Gingrich. Seven percent say they are backing Rep. Ron Paul of Texas, another 2008 presidential candidate, with five percent supporting Rep. Michele Bachmann of Minnesota, who enjoys strong backing from many in the Tea Party movement. Everyone else registers in the low single digits. Trump jumped from 10 percent in a CNN/Opinion Research Corporation poll conducted last month, with Romney dropping from 18 percent to 11 percent. "Are Republicans switching from Romney to Trump? Some are, but it's a lot more complicated than that, as you would expect with 11 potential hats in the ring," adds Holland. "Only one in five Trump supporters say that Romney would be their second choice. It looks like Trump pulls as much support from Gingrich and Palin as from Romney, and Romney's support would go down even if Trump were not in the list of potential candidates." The poll was conducted in the two days before Romney's Monday announcement that he was taking the first formal step towards another bid, by setting up a presidential exploratory committee. According to the survey, more than seven in ten Republicans say that regardless of whom they would support, they'd like to see Huckabee run for the party's presidential nomination, with two-thirds saying the same thing about Romney. But that figure drops to 56 percent for Trump, with 43 percent saying they don't want to see him run. By a narrower 53 to 47 percent margin, they would like to see Palin make a bid for the White House, and by a 51 to 45 percent margin, they would like to see Gingrich run. So what could be behind Trump's rise in the poll? One contributing factor could be his numerous appearances in the national media. Trump's questioning of whether President Barack Obama was born in the U.S. has put Trump smack in the media spotlight the past two months. "If Trump is rising in the polls because of the amount of air time he has gotten, it would be difficult to tell whether his gains are due to what he is saying or simply due to his increased visibility. In a field of more than a dozen potential candidates, all air time is good air time," says Holland. "Most presidential seasons get to a point when the voters are looking for a fresh face. That's what gave us Fred Thompson in 2008 and Wesley Clark in 2004, to name just two examples. If the Republican rank and file has already hit that phase, Trump would be the obvious beneficiary." But being in the top spot in the polls the year before the election doesn't always end with that candidate winning their party's nomination. Both Sen. Hillary Clinton and former New York City Mayor Rudy Giuliani led in the national horserace polls in 2007, with neither ending up taking their party nominations. The CNN/Opinion Research Corporation poll was conducted by telephone, with 824 people questioned. The survey's overall sampling error is plus or minus 3.5 percentage points. Do you believe in a man who doesn't believe Obama was born is the U. S. and also doesn't believe himself to be bald? A man who has bragged about "screwing a head of state"? a man who refuses to accept facts? this is the person who is a front runner in the republican race? what does that say about republicans. This is sad beyond all reason. A business owner, reality tv star, loud-mouth is in a position to possibly be the next President of these here United States. Really, folks??? What the hell is this world coming to? Shouldn't the person running for the job have at least a tiny bit of experience in the field?? Does Trump have ANY prior political experience? (and giving big fat checks to his favorite politician does not count as experience). This is just pathetic. Not shocking at all. Sad, yes, but typical. Someone with no real history of leadership crops up and GOPers buy the fame. Palin for example. Had political office background, but nobody knew her from Adam. However, when the mics went hot asking people about her, "we love Sarah". Who? Now we know the Donald. What is it again? His financial savvy and bull headedness that makes him a natural President. I think not, Birther. What a pander that is. "Obama was born somewhere else!!" That being said, I will now launch and exploratory committee. Look for me on the ballot in 2012 with the rest of'm. Yeaaa! Way to go GOTP!! Polls like this just show that people are reacting to name recognition alone, and making a serious, reasoned choice. However, my other side wishes that the Repubs would be stupid enough to nominate Trump. What a joke that would be. CNN filters out the truth on this. "The Donald" would have to buy CNN to get his "truth out about the Ineligiblity of Obama", the Greatest CON in the History of the World. It has nothing to do with where The Obama was born, but his Parents. Nice, the Republicans want to elect either a guy who thinks Science is "iffy" and doesn't believe in Evolution or a guy who declared bancruptcy.........twice, and failed at marrige 3 times. What a pathetic comment on the American electorate. We've become a nation of morons. Frankly I don't think CNN would be a good investment for The Donald. He'd do better with a new company: TDTN. Who did they poll, 1000 hillbillies?